This is one of those recipes you want to make for your non-vegan friends in order to prove to them that vegan food can be delicious. Consider this curry to be an “ambassador recipe” to the world of non-vegetarians. I have quite a few such recipes, and they nearly always work. This one is great because it includes dried shiitake mushrooms, also called “Chinese black mushrooms,” which you can get at nearly any Asian grocery store. These umami-filled fungi have a wonderful earthy aroma, meaty texture and rich flavor which pair perfectly with chickpeas, also known as chole. I came across this recipe in Geeta Samtani’s excellent cookbook, A Taste of Kashmir while I was gleaning ideas for lunch and dinner specials at Salaam. I like to do at least two or three vegetarian or vegan specials a week, and I really like to find unusual recipes that no one else in town would ever make. As soon as I saw this one, I had to make it. And we sold out of it. People loved it. And, it is simple to make. The one “tricky” part of the recipe is soaking and cooking the mushrooms. I have found that the best method is to boil water, and pour it over the mushrooms, and let them soak until you can stand to stick your fingers into the water. When they are cool enough to touch, they are completely rehydrated. Just squeeze the excess water out, cut off the stem and discard it because it will be too tough, and slice the mushroom cap into thin pieces. 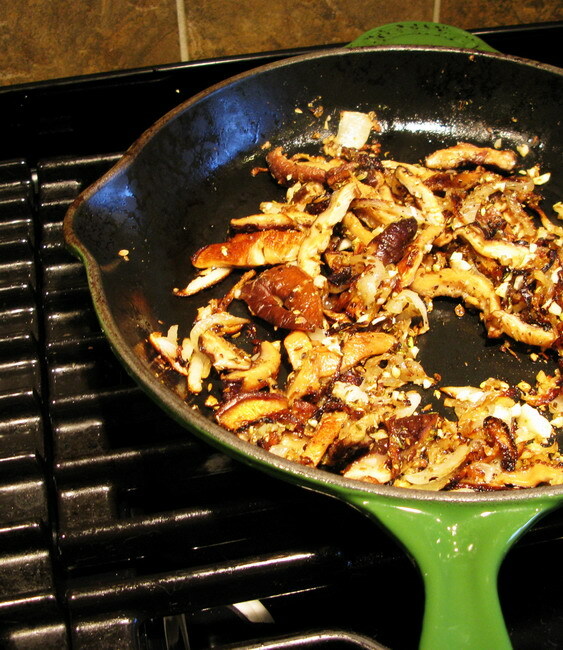 Then let the pieces dry slightly on a paper towel before you saute them with the onions, garlic, ginger and spices–this removed the last of the excess water so that the mushrooms will get just a little bit crispy and absolutely delicious as they cook. The other hint I have for making this recipe is that if you happen to have a bit of hummus in your fridge, instead of mashing some of the chickpeas to thicken the curry, you could add a heaping tablespoon of hummus. I have discovered that you cannot taste the tahini in a curry if you use it as a thickener and the lemon juice, garlic and cumin in it are already part of this recipe to begin with, so it all works out perfectly. This is just a little shortcut if you don’t want to take the time to mash chickpeas, although, in reality, that doesn’t take very long, either, even if you just use a manual potato masher. Put mushrooms in a bowl, and cover with boiling water. Allow to sit while you prep the rest of the ingredients. When the water is cool enough to touch, squeeze out excess water, cut off the stems off, and slice the caps thinly. Sit slices on paper towels to drain while you prepare everything else. KEEP THE MUSHROOM SOAKING WATER!!! 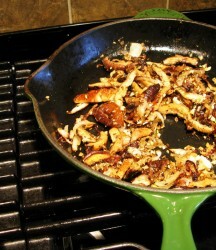 Heat oil in a heavy-bottomed skillet, and add onions, Sprinkle with salt, and cook, stirring, until medium golden brown. Add ginger, and cook. Turn down the heat and simmer for about twenty minutes. Take out about 1/4 of the chickpeas, and mash them to a near puree, and add them back to the pan. Add the tomatoes, and cook until they just begin to wilt. Add the lemon juice and salt to taste, and stir in scallion tops and cilantro leaves. Finally! A recipe that I can use for the huge bag of dried shitakes I have in my pantry! Can’t wait to try this. I am on vacation next week, so I’ll put this on my menu. This looks great! I love all beans, but chole are probably my favorite. Whether Greek, Indian, or North African I’ve never met a garbanzo recipe I haven’t liked. My dad once mentioned that you could actually use the stems of the shiitake mushrooms for vegetarian broths. I’ve never tested it out but I was wondering if you might happen to know if my dad is just pulling my leg. This looks so tasty despite the fact that I have a deeply rooted suspicion of vegan food. What a splendid array of savory spices. There isn’t one I don’t like! And yes, you can use the stems of shitakes to make vegetable stock. They contribute a lot of flavor to it. Just wondering if you have come across a new curry book just published this month: 660 Curries. The author’s name escapes me at the moment, but he did a good article on healthy North Indian cooking for the February edition of Eating Well magazine. Just wondering if you were intending to review it in the future. Barbara, thanks for sharing all the great recipes, especially the veggie ones (though I find many of your nonveg ones easy to adapt). I’ve found that dried black mushrooms sold in Asian markets vary wildly when it comes to flavor. Some seem to absorb some of the less pleasant odors often permeate the markets or just taste strange in general. Others taste great. Any suggestions? About how many does this serve with current ingredients? sgt pepper: Barbara can weigh in as she is an expert, but I have found the bigger (and more expensive) the dried mushrooms usually the better. If they have large light caps, with a bit of cracking on top they are usually quite good. Smaller flat mushrooms that appear shriveled, not so good (although still great for stock!). Pepper–I agree with Diane–the larger, lighter-capped, with crackled looking tops are better quality. The smaller, skeevy-looking ones–not so much. Will–it will make about 4-6 servings depending on how hungry you are and how many other dishes you are making to go with it and how much you like rice. Roxanne–the book isn’t out yet, but I have it on pre-order from Amazon. I have liked his other books, so I will probably order it. Actually–the recipe, as written was vegan–no animal products, not even ghee. But, it is Kashmiri–it is just a traditional vegetarian curry there. So, don’t let my use of the American word, vegan stop you from trying this recipe–it would be a shame if it did. And yes, the stems of shiitake mushrooms are great in stock. I eat everything, which means I never have to pay attention to whether a recipe is vegan, vegetarian, or neither — just whether it sounds good. This one does! I just changed my mind about what to have for dinner tonight. Incidentally — your blog inspired me to buy myself a Christmas present of five Indian cookbooks, Dunlop’s Sichuan cookbook, and a Thai cookbook. I LOVE the new direction my cooking has taken. I haven’t taken so much pleasure in food or cooking for years. Reading your blog, I’ve realised that the vast majority of vegan dishes that I love come from Asia, and almost all of those are spicy. I’m an omnivore and I really like vegetables, but most Western vegan food (outside soups and salads, which Jeff and I could happily subsist off) just seems lacking something to me. Like there’s an animal-shaped hole in the middle of the plate. Are canned chickpeas better than dried ones in this curry? I think that chickpeas are the aristocracy of pulses whatever you do to them, but I do prefer the texture of the dried ones. Barbara, thanks for the recipe ideas on your website. I’ve lurked for awhile and had lots of fun. I have made chole before, but I never would have thought to try it with mushrooms or with basmati. I’ve made it with flatbread before. It was wonderful on the basmati, and the mushrooms worked well. Of course, I changed it a little, as most cooks do. I used amchur rather than the lemon juice, for example, and upped the cloves. Please keep posting with the inspsiring recipes. Only thanks to you I searched out a place where I could buy Chinese ingredients (I only have a Loatian grocer anywhere nearby). I finally have chinese light soy sauce again, instead of using kikkoman for everything. You are changing other people’s pantries! Keep it up! Barbara this sounds delicious, do you think it would freeze well? I am amazed by your creativity. Thank you for posting this one, vegan curries are always the best. Rachel–you don’t know how pleased your words make me feel! I really hope you enjoy your cookbooks–it sounds like you are–and please, keep cooking! Cooking great-tasting, healthy foods for yourself, your friends and family is a wonderful way to connect with each other and the world. I am glad to have inspired you and I hope to continue to do so. It was sad–when I went to London with my first husband, he hated Indian food, so I only ate curry once. Someday, however, I will go back…. I tend to prefer Asian vegan/vegetarian foods, too. I have always said that if I ever became a vegetarian, it would only be if I mostly ate Indian, Thai and Chinese foods, because they were so good that I seldom miss the meat. But–on the other hand, there are some great American vegetarian dishes, too–like Cajun beans and rice, or the old classic, macaroni and cheese (baked and homemade, of course.) It isn’t that western vegetarian food that is good doesn’t exist, it is just that there isn’t as much of a tradition of it, so the great dishes are more exceptional than the great Asian vegetarian dishes, of which there are thousands. Janet, it would freeze like a dream. All of the ingredients freeze perfectly well, although, for best texture, you might leave out the tomatoes, and add them after you reheat. Zlamushka–I am glad you liked this one. Last night at work, for a vegan dinner special, I made a really, really good saag massoor dal–spinach and red lentils. Our dish washer, Guenivere (yeah, that really is her name–cool, huh?) wanted to know what all was in it, and it tasted so rich and good, she thought it might have butter in it. But it didn’t–it had very little oil at all in it. That browned buttery flavor came from browning the onions slowly and deeply, and then cooking the garlic and spices with them for a long time on low heat before adding them to the lentils. May I use your recipe in my email newsletter? I want to change it so that it can be prepared in the pressure cooker. It will be great to give my audience something to do with the incredible organic shiitakes that I have to offer them. I love vegan recipes that are just great food. What a wonderful curry recipe. Who can say NO to a dish like this (unless they dislike curry)? Thank you. Thanks for this recipe! I used dried chickpeas instead of canned — I suspect I should have used a little salt when cooking the chickpeas, because they were a little bland in the finished product. Or perhaps I didn’t simmer them for long enough in the curry spices for them to soak up flavour. But the gravy and mushrooms were absolutely delicious. I made this Sunday (with dried chickpeas) and it was excellent! Next time though I think I will mix fresh and dried mushrooms. Wonderful! My wife and daughter are washing the dishes right now, after the three of us ate almost the whole recipe. 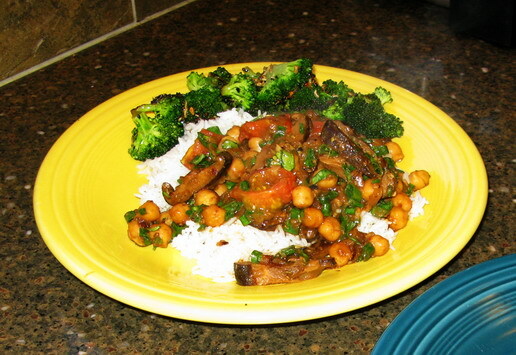 I needed to add water as the curry was simmering, because I had not used very much when I soaked the mushrooms. It might be a good idea to mention this in the recipe. I tried this recipe this week Barbara. It was really good. I especially wanted to thank you for the wonderful hummus tip! Simply ingenious. Delicious, Barbara, thank you! Even with just fresh portabella mushroom and half the spices (what I had on hand) 🙂 I’ll be making this again and again! Just finished making it for lunch with brown rice. 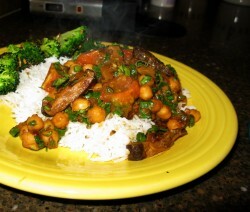 It tastes fabulous, different from the channa masala I usually make. Thanks again.